Skin cancer is the most prevalent form of cancer in the United States, with more new cases occurring each year than every other form of cancer combined. Melanoma is the deadliest form of skin cancer and research asserts that UV radiation exposure is its primary cause. The graph below demonstrates that melanoma incidences have increased at an average rate of roughly 4.37% annually while the American population has only grown at an average rate of 1.02% annually in the same amount of time (1999-2015). Melanoma is highly preventable, more so than any other form of cancer. The intensification of UV rays caused by ozone layer depletion, and a continued indifference towards protection from the sun account for the steady increase in melanoma incidences in America. Responsible sun exposure by wearing sun-protective clothing, sunscreen, and sunglasses, and seeing a dermatologist every six months for an examination, must replace the current apathetic culture which is contributing to the annual increase in cases of melanoma. Melanoma prevention matters because it is easy to practice and highly effective. The best way to protect yourself from the sun's UVA/UVB radiation, which is known as the primary cause of melanoma, is to wear UPF-rated clothing. Fabrics with a UPF rating of 50 or higher capture more than 98% of the UV radiation to which you would've been exposed. The head, neck, and back are highly exposed areas; accordingly, the majority of diagnosed melanomas occur in those areas. Wearing a wide-brimmed, UPF-rated hat is a highly recommended precaution when spending time in the sun. Use a sunscreen with an SPF of 30 or higher that provides broad-spectrum coverage (meaning that it protects from both UVA and UVB radiation), and is water-resistant. Make sure that your sunscreen is not expired. Apply sunscreen before exposing yourself to the sun. It takes approximately 15 minutes for your skin to absorb the sunscreen. All exposed skin should be covered in sunscreen. Highly sun sensitive areas include the neck, face, ears, tops of the feet and legs, the back, and the scalp (if exposed). To protect the lips, apply a lip balm with an SPF of 15 or higher. Reapply sunscreen every two hours, or directly after sweating or swimming. The UV Index (UVI) is a measure of the level and intensity of UV radiation reaching the earth's surface. A high UVI corresponds to increased skin cancer risk because the sun's UV rays are more penetrating. The UVI is included in the daily weather report; use the chart below to understand how your region's UVI should inform your skin cancer prevention. SPF is an acronym for Sun Protection Factor; UPF stands for Ultraviolet Protection Factor. Both SPF and UPF are indicators of a product's ability to block/absorb/deflect UV radiation. SPF reflects how much longer one can stay in the sun, exposed to UV radiation, before experiencing sun damage. Sunscreen with SPF 30 theoretically prolongs an individual's sun exposure time before damage by a multiple of 30. All sunscreens protect from UVB radiation, but only broad spectrum sunscreens protect from both UVA and UVB radiation. UPF is a scale used to describe effectiveness of sun-protective fabrics. UPF ratings reflect the amount of UV radiation blocked, rather than protected exposure time. A garment with a UPF rating of 50 blocks out 98% of UV rays. All UPF-rated clothing protects from both UVA and UVB radiation. Physical sunscreens deflect and scatter UV radiation, acting like a shield against the sun's rays. The most common active ingredient in physical sunscreens is zinc oxide (sometimes titanium dioxide). The AAD recommends this type of sunscreen for people with sensitive skin. Chemical Sunscreens absorb UV radiation. The most common active ingredients in chemical sunscreens are oxybenzone, avobenzone, octisalate, octocrylene, homosalate, and octinoxate. These sunscreens are easier to rub into the skin, and are therefore less likely to come off than physical sunscreens. Use a physical sunscreen when visiting the beach or swimming in the ocean because the active ingredients in chemically-blocking sunscreens, oxybenzone, octinoxate and octocrylene, contribute to coral reef decay and threaten marine life. According to internationally agreed upon standards, sun-protected skin is that to which 2mg of sunscreen per square centimeter has been applied. Visit the Know Melanoma Sunscreen Calculator to find out how much sunscreen you need for each part of your body in order to achieve your sunscreen's advertised SPF rating. Wear sunglasses that offer 99-100% UV blockage to prevent melanoma on the sensitive skin surrounding your eyes. Sunglasses labelled "UV 400" or "Meets ANSI UV Requirements" block at least 99% of UV rays. Sunglasses labelled "Cosmetic" only block about 70% of UV rays, which is insufficient for practicing proper melanoma prevention. Larger-framed sunglasses block a greater number of angles from which UV rays can penetrate your eyes and surrounding skin. Although it may not be your style, the larger your sunglasses, the better protected your face is. It is important to note that ocular melanoma (a rare form of eye cancer which is biologically distinct from melanoma of the skin) is not caused by UV radiation, so it is a common misconception that wearing sunglasses will protect your eyes from ocular melanoma. Although most contact lenses are now manufactured to provide protection from UV radiation, contacts do not protect the whole eye or the sun-sensitive skin around the eye. Therefore, the same eye protection tips apply to contact users and non-users alike. 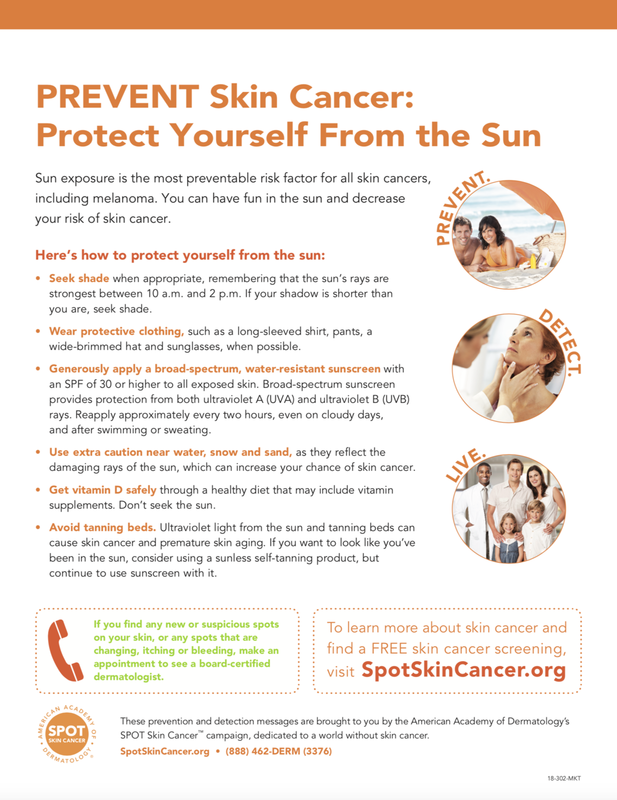 The World Health Organization reports "Lifetime risk [of skin cancer] is strongly determined by exposure to the sun during the first 15 or so years of life (English et ai., 1997; 1998b)." Because adolescent exposure to sun is largely responsible for the development of skin cancer, it is especially important for children to take precautions against skin cancer. Therefore, it is essential that children wear UV-rated sunglasses, in addition to applying sunscreen, wearing sun protective clothing, and visiting the pediatrician annually. Skin cancer is diagnosed in more people each year in the United States than all other cancers combined. It is recommended that you visit your dermatologist at least once every six months for a full-body examination/skin cancer screening. Your dermatologist can identify and biopsy potentially cancerous lesions. If you are diagnosed with skin cancer, you and your doctor may discuss treatment options. Besides surgically removing the cancerous skin, certain forms and progressions of melanoma are also treated using immuno-therapy, a method which utilizes drugs that train your immune system to fight cancer. Immuno-therapy is a relatively new cancer treatment, but drugs such as Keytruda (Pembrolizumab) have demonstrated high efficacy rates in the treatment of melanoma. Click here to find a board-certified dermatologist near you. Besides visiting your dermatologist once a year for a full-body examination, dermatologists and cancer centers worldwide recommend that you conduct a skin cancer self exam every month. Nearly all skin cancer is treatable when caught early enough, so it is important to keep track of worrisome spots and lesions on your body. The AAD publishes a free body mole map which you can download and print by clicking the photo above. The "ABCDEs" of skin cancer is a helpful acronym for identifying potentially cancerous lesions. When surveying your moles, watch out for the following signs which may indicate the presence of melanoma. Although the "ABCDEs" of melanoma describe typically accurate indications of melanoma, melanomas occur in many different forms. In some cases, moles that don't exhibit any of the traits listed below are still cancerous. For this reason, it is very important to see your dermatologist at least once a year in addition to performing self examinations. Dr. Mike Evans offers an in-depth analysis of melanoma prevention and detection methods. Citing fascinating studies and facts, he conveys the need for increased melanoma awareness. Dr. John Iskander of the CDC and Admiral Boris Lushniak, former acting Surgeon General of the United States, discuss America's skin cancer epidemic on Beyond the Data.